Paramount Pictures sought a change in pace after the previous film in the series, Star Trek: First Contact (1996). Michael Piller was asked to write its script, which was created from story ideas by Piller and producer Rick Berman. The story's first drafts featured the Romulans, and the Son'a and Ba'ku were introduced in its third draft. After Ira Steven Behr reviewed the script, Piller revised it and added a subplot involving a romantic interest for Jean-Luc Picard. The film's ending was further revised after test screenings. The special effects depicting outer space were completely computer generated, a first for a Star Trek film. The Ba'ku village was fully built on location at Lake Sherwood, California, but suffered weather damage. Sets from the television series Star Trek: Voyager and Star Trek: Deep Space Nine were reused and redressed. Michael Westmore created the make-up for the new alien races, and Robert Blackman revised the Starfleet dress uniform designs. Sanja Milkovic Hayes created costumes for the Ba'ku from cellulose fibers, which were baked and glued together. Jerry Goldsmith produced the film's score; his fourth for the franchise. 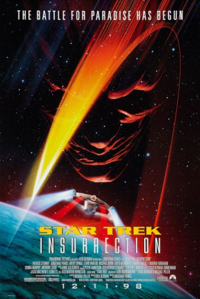 This webpage uses material from the Wikipedia article "Star_Trek%3A_Insurrection" and is licensed under the GNU Free Documentation License. Reality TV World is not responsible for any errors or omissions the Wikipedia article may contain.